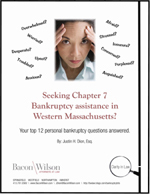 Everything that consumers, businesses and professional service people need to know about bankruptcy. © 2011, Bacon Wilson, P.C. This video has been prepared by Bacon Wilson, P.C. for informational purposes only and is not intended and should not be construed as legal advice. This information is not intended to create, and receipt of it does not constitute, a lawyer-client relationship. Viewers should not act upon this information without seeking professional counsel. Do not send us information until you speak with one of our lawyers and get authorization to send that information to us. This is an interesting blog site that always has something nice to offer through its posts.Keep posting similar interesting posts on your site.Thanks for sharing. Hi There, I just wanted to take a minute to commend you on your bankruptcy videos. I am a fellow bankruptcy lawyer (Phoenix and (Tucson) and I have really been procrastinating getting myself in front of the camera. I just have to say, you are extremely natural in front of the camera. Thanks, Chris. It gets easier the more you work on it!